In response to the many requests, we organised a repeat of last year’s charity day at Sandringham and the 8th October saw a fine collection of Rovers, Mercedes, Porsches and MG lined up on the Vista by kind permission of the estate management. Star of the show was Norfolk’s oldest still running car, a 1899 Panhard LeVassor once owned by Charles Rolls and now at the Gressenhall Rural Life Museum. Our chosen charity was again the East Anglian Air Ambulance and we were please to raise over £1200 in donations from those who brought their cars along for the day. Prizes of a specially engraved glass were awarded to the best in each class. The Grand Henham Steam Rally has become a regular on our event calendar and a group of members made the trip down to Henham Park on 17th September for our annual pilgrimage. There had been much rain in the week leading up to the event, leaving the field quite wet and the estate roads quite muddy, but it was fine on the day and we all had a good time exploring all the trade stalls and looking at all the cars & other exhibits. The only downside was having to hose down the undersides of our cars when we returned home. The 3rd September saw us join up with the NCVC for a very enjoyable lunch at Alby Crafts followed by a visit to the nearby Gunton Sawmill. This is a traditional water powered mill, on the Gunton estate, dating from the 19th century, that has been restored by a group of very knowledgeable volunteers and retains all of the original machinery. It is still used today to provide cut timber for the estate. The annual ladies day out this year was a mystery trip around Norfolk on Eastons classic 1958 Bedford SB Duple Vaga coach. First port of call after an enjoyable ride through a number of attractive villages was Langham Glass where a demonstration of glass making was laid on and then lunch. In the afternoon a ride through a number of other villages took the party to Sheringham for tea & cakes in the station buffet before a pleasant ride home. Another enjoyable day out thanks to Eastons and their brilliant driver Colin. 11 intrepid members from our club made the long(ish) trek to Roverfest in Warwick shire on 13 August to join some 800+ other Rovers in celebrating the marque and the 50th anniversary of the V8 engine. The weekend included a trip to Gaydon on the Saturday where there was also a driving test event. Drivers had to guess the height and width of their cars and complete a mini course. Best of all, and the highlight of the show for us, was our member Graham Teeson’s P2 20 Sports Saloon being chosen as the best Rover of the whole Show. A real feather in the cap for both Graham and our club. The P6 National this year was held on 6th August at the splendid Castle Howard in Yorkshire. A handful of our more adventurous members made the 450 mile round trip from Norfolk to the event and had a really good weekend away. All in all there were around 70 cars on display with at least 60 being P6’s and a few modern and non rovers. There was a good selection of 2000, 2200 and 3500 and a very interesting Estate. As usual winners were chosen by those attending and remarkably the furthest travelled was a Lotus Europa from Sweden. Having Sunday lunches out has become an enjoyable if not quite regular past time for a small group of members and our latest, on 26 July, was at Hermanus in a cosy restaurant overlooking the sea. Following an excellent roast we then went on to have afternoon tea at Roger & Pam Keeley’s lovely house at Winterton, and to look at Roger’s ‘O’ garden railway. What better way to spend a relaxing Sunday and Roger & Pam made us feel very welcome. 16th July saw a number of our members make the annual trip to Hoverton, next to Wroxham on the Broads. This is quite a large event, held for charity, and there where again several hundred cars present. The Weeting show over the weekend of the 14th to 16th July was bigger than ever with not only classics cars but many commercial and services vehicles on show, in addition to steam and agricultural vehicles. There were trade and craft stall a plenty in addition to the many arena events and rides. One of the attractions is the many ‘working’ steam activities each day which included sawing, threshing, lifting, ploughing, etc in addition to working standard and narrow gauge steam railways. As usual, we took our turns in the arena to talk about our cars and had a really good day. We were invited by the Suffolk Vehicle Enthusiasts Club to join them at Martlesham Heath on 9th July to celebrate the 100 year history of the former air base. However, the cars were not the main attraction as there were plenty of activities in the main arena, including the Ipswich Piping Society, Dog Agility Team, the Brentwood Imperial Youth Band and a very impressive Red Devils Parachute Team display. On the stage there was 100 years of music and dancing all day. The highlight of the day was the Battle of Britain Memorial Flight Flypast by a Spitfire and Hurricane, a wonderful sight and sound. Few of us had attended the Mid Lincs all Rover rally at East Kirkby since its move to Saturday (always other things to do) but the event on 8th July this year was going to be the last one, at least in its present form, so we just had to go along; 14 club cars in all. The show was as good as ever with over 240 cars, a flypast by 2 Spitfires and of course the fast taxi runs by the Lancaster ‘Just Jane’. The sun shone all day and to cap it all our members won best P4 and best P5. The Maldon car show on 2nd July is organised by Chelmer Valley Events and is an extremely large show with at least 1500 classic cars as well as buses and military vehicles. There was the usual auto jumble, trade stalls, live music all day and dancing. The setting was along the Promenade with cars parked alongside the River Blackwater Estuary as well as around the Park. There was plenty to see and do all day, including screenings in the Vintage Mobile Camera, as seen on TV. A 180 mile round trip but well worth the early start. 2nd July and a glorious day at the North Norfolk Railway. Over 400 cars in all, which included 12 club cars, in addition to a selection of commercial vehicles and 15 classic buses which were giving rides all day. On the railway there were 2 steam trains one ‘Peak’ diesel hauled train and the DMU shuttling between Holt and Sheringham, in parallel with the buses. In addition, in Holt station yard, the miniature railway was operating and the narrow gauge loco ‘Alice’ from the Bala Steam Railway of Wales was doing demonstration runs. A very full and enjoyable day. As our National Trust visit this year we had decided to revisit Fellbrigg Hall up in North Norfolk. This is a compact but interesting house with parkland, a very attractive and well laid out walled garden, and a pleasant walk down to the church. We had 6 cars on display, rather less than expected, in a key position on the lawn by the restaurant and many of the visitor came to take a look. On the same day, 25th June, a few members took part in the Sporting Car Club of Norfolk’s 80 mile road run from Dereham through the Norfolk countryside ending up at the East Anglia Transport Museum at Carlton Colville. A cooler day than of late which meant more comfortable & pleasant motoring. Gressenhall on 18th June was another first for the club and we had invited the NCVC to join us. This was part of the venues ‘Big Boys Toys’ day and it was interesting exploring the museum but it was one of the hotes day of the year, which undersatandably kept many people away and we spent much of the day simple sheltering under the shade of the trees. Sunday June 11th and another great day out for a group of club members. The morning was taken up with a road run out to the coast at Walcott where we had a very enjoyable lunch at the Lighthouse Inn. Really good food and even their small portions are huge, delicious deserts as well. We then went on to East Ruston Vicarage Gardens, which was another great treat with so much to see that another visit is a must. We must have walked miles around all the paths with new surprises at every turn. By the end of the afternoon our tired limbs told it was time to sit down for tea and cakes before leaving for home – well we never need much of an excuse! We were invited along to the NCVC fun day at Strumpshaw on 4th June to put on our century of Rover cars display. In addition to the display line a number of other club cars came along making 17 in total. This is a very large show with many hundreds of cars but the icing on the cake for us was winning the best club stand trophy. The entertainment included a guitar duo playing Shadows and other numbers, and a an excellent Frankie Valli tribute group, Frankies Guys, who put on a really professional show for us. This year was our 40th All Rover Rally at Bressingham and we certainly celebrated the occasion in style. Go back to our home page to read all about it and look at the pictures & video. The Stradsett vintage show was on 29th April this year and several members went along to enjoy the day. In addition to the many trade stalls there was a good display of cars, trucks, heavy horses, agricultural and steam exhibits, and we all took our turn it the arena to talk about our vehicles. This is now quite a large show and we were please to be able to put our feet up in the afternoon and rest a while in the sunshine. Drive it Day, 23 April. Some 20 members enjoyed a leisurely 50 mile road run around rural Norfolk, arriving at Carlton Colville Transport museum in good time for lunch. This is a working museum with preserved buses, trolleybuses, trams etc. and is laid out as a street scene. We were very kindly allowed to park our classics within the grounds, alongside the museums own exhibits and in addition to taking ride on many of the vehicles, many of our members took the opportunity to also browse the excellent bookshop and of course indulge in tea and cakes before leaving for home. 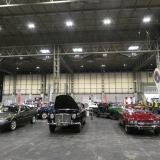 NEC restoration show was extended to 3 days this year, from 31 March to 2 April. It gets better every year with a fantastic amount to see & do and we all had a really good time. We received many positive comments about our stand, which was as good if not better than mos, showing the Hearse and an 827 Stirling. As well as giving members the opportunity to show off their cars, the show gets us recognised, gives us good publicity through writ-ups and an is opportunity both to network and to pick up some good bargains. The 14th March saw a number of members take a coach trip to the Brooklands museum near Weybridge. This was the base for Vickers Aviation and many of their historic aircraft are on display. Prior the that it was a major motor racing circuit and the history of that period is very well told with part of the old circuit banking still to be seen in addition to many of the racing and other cars of that period. Almost too much to see in a day.